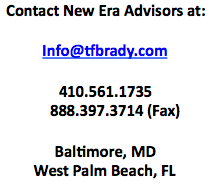 New Era Advisors is a specialty advisory service providing general business consulting to select clientele. Founder and President Tom Brady has over 40 years of business experience including “C Level” responsibility, corporate strategy, M & A transactions and the Boardroom. Tom is Chairman of the Opower Business Advisory Board and Chairman of the Board of ENBALA Power networks. Opower (www.opower.com), a Global Cleantech 100 company, is a leader in energy information software, providing the utility industry’s only cross-channel platform proven to drive energy efficiency gains on a large scale. ENBALA Power Networks (www.enbala.com) has created a unique smart grid optimization platform that provides continuous real time balancing of the electricity grid using demand side assets. Also, Tom serves on the Board of Trustees of Corporate Office Properties Trust (NYSE: OFC) an S & P 400 office real estate investment trust (www.copt.com); and the Board of Directors of Baltimore Gas and Electric Company (BGE), Maryland’s largest electric and gas utility serving over 1.2 million customers (www.bge.com) and an affiliate of Constellation Energy (NYSE:CEG) (www.constellation.com) .